Hitler’s rise to power in 1933 and the passage of the economically restrictive Nuremberg Laws pauperized the Jewish community in Germany, and JDC’s support became critical. Channeled through local Jewish relief organizations, JDC funds subsidized medical care, Jewish schools and educational activities, welfare programs, loan funds, emigration, and centers for vocational and agricultural training, including a hachsharah (training) program for prospective immigrants to Palestine. Later, support was extended to Jewish communities in Nazi-annexed Austria and occupied Czechoslovakia. Emigration aid soon became the priority, as JDC focused on helping Jews fleeing from Nazi Germany, Austria, and Czechoslovakia. JDC provided food, shelter, and medical care for stranded refugees; it helped cover travel expenses and landing fees; and it secured travel accommodations and all-important visas for countries of refuge. By the end of 1939, JDC-supported organizations had helped some 110,000 Jews emigrate from Germany— 30,000 in 1939 alone. In 1940, JDC was helping refugees in transit in more than 40 countries. 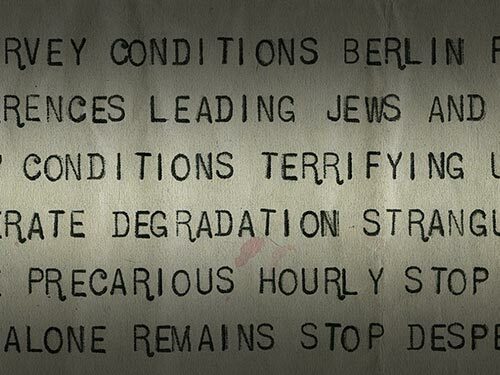 From the outbreak of World War II through 1944, JDC enabled over 81,000 Jews to emigrate. JDC allocated funds to assist refugees in temporary European havens and tried to help them find permanent refuge in the United States, Palestine, and Latin America. It set up a Jewish agricultural settlement in Sosua, in the Dominican Republic, in response to General Trujillo’s offer to open his country to European refugees. In 1939, when some 900 German Jewish refugees on the SS St. Louis were denied entry into Cuba, JDC’s round-the-clock negotiations opened European doors to the passengers, saving many. Following the outbreak of World War II, JDC opened shelters and soup kitchens for thousands of Jewish refugees in Poland, aiding some 600,000 in 1940. It subsidized hospitals, child care centers, and educational and cultural programs and even shipped in tons of Passover supplies. With U.S. entry into the war in December 1941, JDC could no longer operate legally in enemy countries. JDC representatives borrowed money locally and used a variety of international connections to channel aid to Jews living in desperate conditions behind what were now enemy lines. From its wartime headquarters in Lisbon, JDC chartered ships and continued to help thousands of refugees escape from Europe through various routes. In France, JDC financed legal and illegal organizations. It funneled in funds to support some 7,000 Jewish children in hiding and to smuggle over 1,000 more to Switzerland and Spain, and it smuggled aid to Jewish prisoners in labor camps. In Shanghai, a JDC relief program supported some 15,000 Jewish refugees from Central and Eastern Europe. Packages were shipped from Tehran to Polish and Ukrainian Jews who had fled to Central Asia; supplies were parachuted into Yugoslavia; and funds were delivered to the Polish Jewish underground, some of them to help finance preparations for the 1943 Warsaw Ghetto revolt.